WASHINGTON, DC—President Donald Trump helped hide the Easter eggs for the White House Easter Egg Roll, bucking the widely held belief that he doesn’t participate in public events. Swaggering onto the White House lawn carrying a Big Bertha driver, President Trump launched the colored eggs to different spots on the White House lawn, bystanders noted. Interviews with crying children suggested that Trump had launched their eggs just before they were about to be picked up. 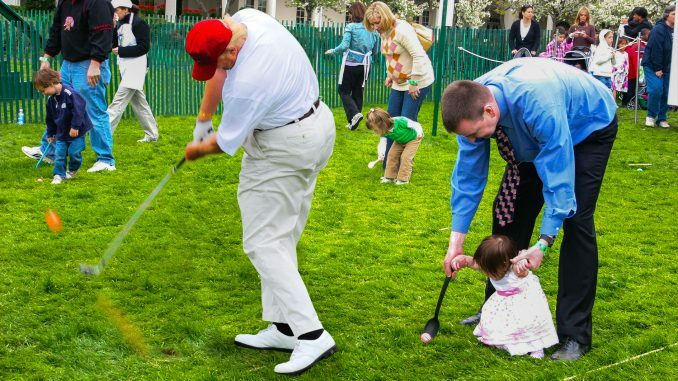 “Next year, I might try to work on my short irons,” the President said.